Slating and Tiling, felt roofing, flat roofing, guttering, lead-works etc. We are based in Croydon but offer our roofing services throughout the City of London including Greenwich, Islington, Westminster, Hammersmith and Fulham. We aim to provide a reliable, dependable and quality roofing service to all our customers. All work be it minor repairs or complete new roofs, can be undertaken. We pride ourselves on high quality workmanship and maximum availability of roofing services to meet our clients needs. Our work is our reputation and we at Knightsbridge Roofing never forget this. We are members of Construction line as well as CHAS approved and we are also members of the Confederation Of Roofing Contractors. I needed a couple of holes in roof patched up, and Knightsbridge Roofing were very quick at coming round to give a quotation, and then performing the job while I was out a few days later. From the pictures everything seems to be sorted and at a reasonable price. Would recommend. Keith and his team were helpful from start to finish. We needed to have our chimneys re-rendered and re-leaded to fix a leak. We had a bad experience with a previous rogue trader and they repaired all of the bad work, going the extra mile to ensure we felt reassured and could be confident in the work they completed. They gave us progress pictures all the way through and helped us to understand the different decisions that needed to be made. I would highly recommend Keith and his team, they were happy to work around our young family's needs while getting the job done on schedule and cleaning up afterwards. Thank you all! We selected Knightsbridge Roofing limited after looking at the customer reviews on Which local. Knightsbridge did not disappoint us. They were very prompt in answering the telephone. Keith came to our house to provide a quotation and also provided valuable advice on how best to deal with the lead works on our roof. The workmen Kelly and George were also like Keith polite, started and finished the job on time. In addition they replaced few tiles which were broken free of charge. 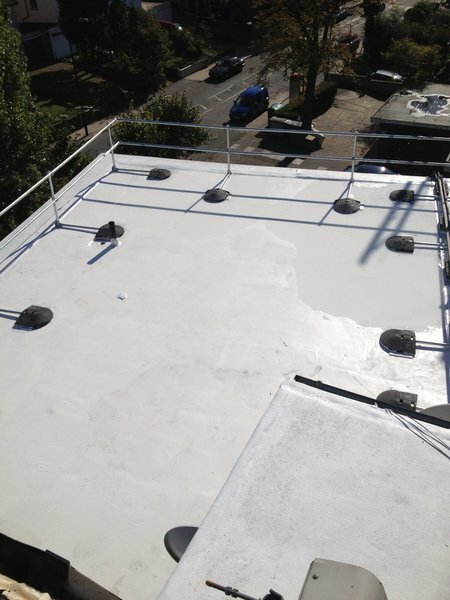 Also provided pictures of the area of the roof before and after the work was completed, which was very useful. I recommended her to my sister who had problem with her house guttering. Again Keith arrived at short notice explained the best way to deal with the problem. She was also impressed and Knightsbridge Ltd was hired. The workers carried out the work to her full satisfaction. Further. they also cleaned the fascia and cladding of her house at no extra cost. There work is professional, tidy and efficient. I would recommend Knightsbridge Roofing Ltd without any hesitation. I was extremely satisfied with the works carried out by Keith and his team at Knightsbridge Roofing, Our issues with our roof were solved very quickly and efficiently and I would definitely use them again in the future. Highly recommend! 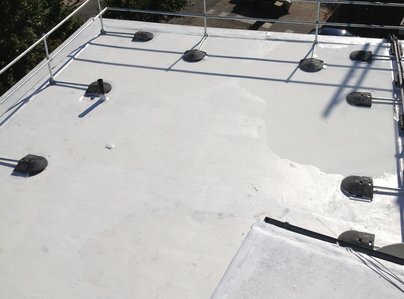 We were very pleased with the service from Keith and the men who carried out the repair to our flat roof. Keith came promptly, diagnosed the problem and the work was done in an efficient, professional and friendly way. There has been heavy rain since the repair and no sign of a water leak! Keith is very professional and gave us great advice about our flat roof. When we made the decision to replace it he was able to do the job within days. His team were polite, tidy and got the job done on time. 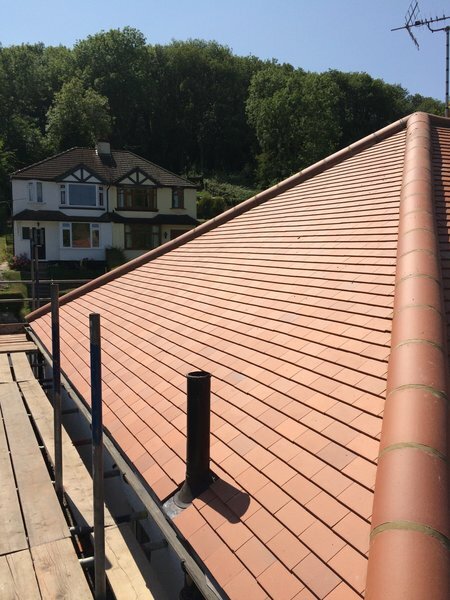 We were very impressed and would not hesitate to recommend Knightsbridge Roofing. Keith has been professional and brilliant with our flat roof. The job was completed on time and his team were fantastic. I wouldn’t hesitate to recommend him. Knightsbridge Roofing repaired my guttering earlier this year, turned up on time, good job, polite and friendly workers. They also visited recently for a possible reconfiguring of my guttering. Keith suggested another solution and cleared them out while he was here. This is one of those companies you always have on your shortlist for work and I'll be contacting Keith for a quote when I next need work carried out. Recommended. I have used Knightsbridge several times for repairs of various sizes I've needed to my roof and have been pleased with their service on each occasion. Keith always turns turns up on time to assess the job and explains clearly what is required without trying to oversell you anything. His workmen are also quick, tidy and do a good job of explaining what they're doing. We needed the roof of the front bay window replacing and thought we needed a new roof to the our house. Keith visited and reassured us the roof was fine, just some minor repairs to the flashing was needed. Out of three different companies, Keith stood out regarding first impressions, he was clear in telling us what needed doing and gave us two quotes, explaining both options and allowed us to decide without any pressure. The work was done within schedule, budget and to an excellent standard. His team were polite and courteous and cleared up after themselves. Would definitely recommend and use for future works.